I tested this product when my monthly friend came for a visit. 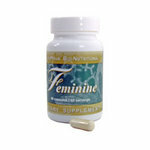 I heard that Feminine would help relieve my PMS symptoms. I do not really think it worked. I felt less bloated but I don't think that it was worth it.